Finch and I go to the library at least once a week and I just love ordering books into my own branch. The Toronto Public Library system is one of the most used library systems in the world... is that right? I am sure I read that someplace...You can get almost anything. So my latest request was this bo0k which I had noticed while leafing through a years worth of quilting magazines from my lovely friend up the street. I loved looking though the book at lunchtime, though I wanted more more more color pictures of all the gorgeous quilts and sweaters and paintings. It is an autobiography so there were lots of words obviously, and the ones I managed to read were very interesting- what a life! I will just have to order in more of his books. Still, I had to immediately do some drawing and of course Finch has to do whatever I am doing and we had a lovely 12-16 minutes on the porch partaking in this. Nothing lasts long with a three year old. Unfortunate crappy iphone pictures but you get the idea. Some doodling was done and Finch did his drawings all for me, which was a sweet ending to our art moment. Hooray here they are all done, and just in time for a chilly spell. I love them so much! Cozy and colourful. I am just thrilled though, with the way the new pair are coming out. How did they ever figure out how to die yarn so it makes a lovely stripey ziggy pattern when knitted up? Will wonders never cease... 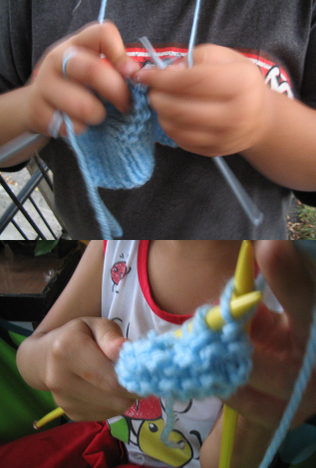 It has been nice to do a bit of knitting again, mostly when Finch watches tv or plays in the sandbox. I knit these guys over the summer for my good friend who had her baby in...my goodness- was it May or April? June? Anyway, as you can see, they are just a bit wonky! One does seem fatter than the other. Not too bad for my first pair ever I suppose, but the other part of the story that you can't readily see from the picture, is that they are too big for a newborn. They might be too big for a 2 or 3 year old. I sent them anyway! With a disclaimer and a mention that it was the thought that counts! I just had to try the cute mary jane pattern. It's from an old Knit simple magazine. This-y here is a scarf from Marimekko! It was the only thing I could afford at the shop in NYC. I have it pinned on the wall in my bedroom- so cheerful! On the weekend I sat down to learn cables and once again, it really was not a hard as I thought! I *think* the pattern had a typo, but I figured it out. It said C6 but I think it should have read C3! 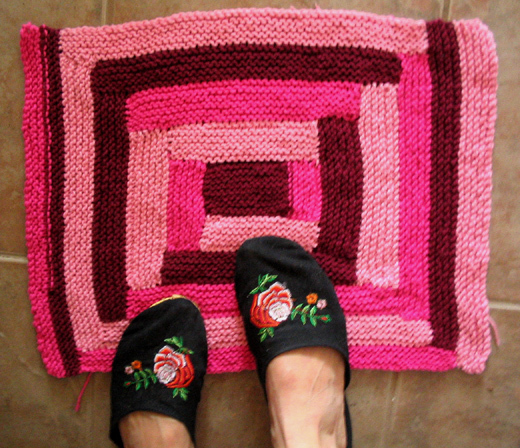 About ten years ago, my mum's friend knit her an entire afghan for a house warming gift, made up of squares of different cable patterns. It was stunning! I love the thought of a whole new pack of challenging knitting patterns awaiting me... perhaps an afghan is in my future -or at least a scarf! Which brings me to this series. I started with book 2, 3 and then 4 and just last night finished book 1. I think that had to do simply with availability at the library but now I am sad they are all done. I know there is a 5th coming out in May though. They are loosley centered around a knitting shop as well as along a nice street but they are written as though you are spending time with your best friends and I miss them already. I know that sounds sappy. There was a time when I would only read "challenging intellectual literature" but nowadays my main criteria is an easy, comforting read with characters I can imagine being my friends. I tend to call these kinds of books "airport books" since you imagine grabbing them as a distraction for a long flight. I, however , grab them now as a welcome distraction from the sometimes long trials of life. It gives me no end of pleasure to spend a Sunday afternoon ignoring the cleaning and reading good story, cup of tea in hand. So I am sorry teenaged Tania, I am no longer slogging through Albert Camus or Henry Miller but drifting happily into stories about nice people doing trying to do nice things, while navigating their own sometimes challenging lives. It's called escapism and I'm sold. I spent a lot of the holidays knitting because it is one of my favorite things to do. I found this fishtail pattern somewhere online and decided it would be a good application for this lovely yarn I received as part of my payment a number of years ago for drawing the logo for Hipknits. I had at first assumed it was sock yarn because it was so thin, but later was told it might be too fine for that. I forget what its content is, but its lovely and soft. Socks would have gotten holes quickly! So now it is two feet of scarf with more to come. 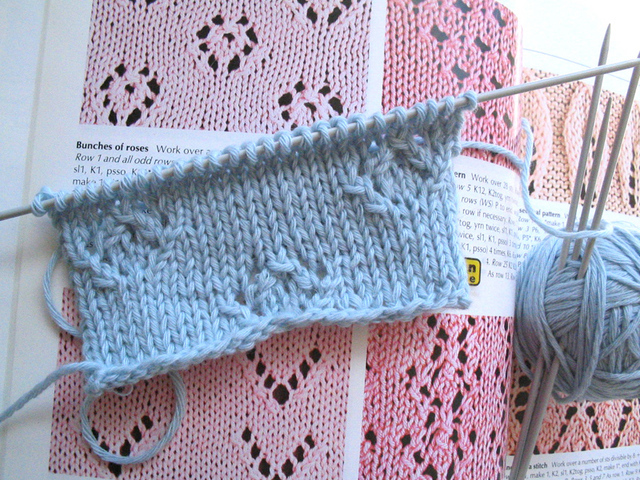 Knitting a lace pattern like this makes me feel awfully clever and its not so hard after all! I intend to learn cables next. That is what I love about knitting. It is so skill level oriented. You can just keep learning and learning! Or you can knit scarves for ever. Whatever suits your fancy - its a great feeling. 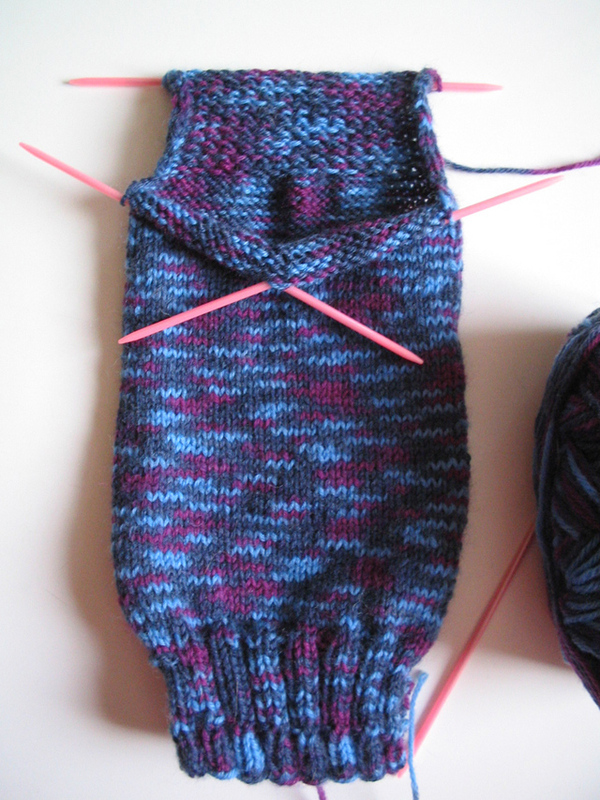 I also started up a new pair of socks wth the yummy yarn I got on etsy from Ruby Sapphire last year. Isn't it pretty! I am using a basic sock pattern even though I had been worried this yarn was a tad thinner than the yarn specified in the pattern. In the end I decided I needed to just use the yarn and not leave it laying around for girl cat to steal and wreak havoc with. She likes to discover it in my knitting basket over and over and trot off triumphantly with it in her teeth. My camera battery was dead today so I decided it would be cuter to draw the things I have knitted recently, instead of just a plain old photograph. 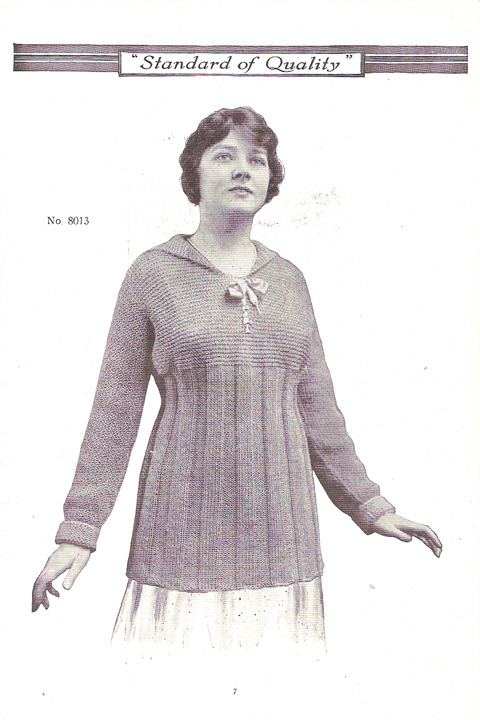 As we can see from the diagram, I have been busy knitting. Up on the top left, we see a representation of the pair of legwarmers I finished last week. They are pink and brown stripes, but the stripes are different on each leg to make it interesting easy. 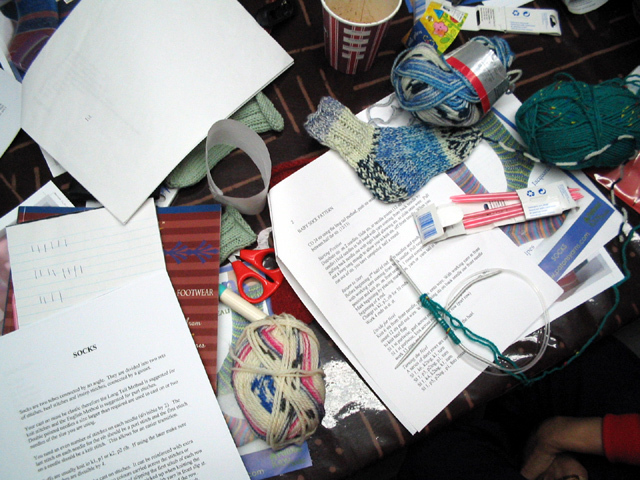 At the top right, we see a big blue hat, knit from super bulky and warm yarn I found at the craft swap last year. I had already knit one hat from this but unknit it when I realised it needed a folded ribbed brim to add an extra layer of warmth around the ears, and to make it even more enourmous looking- oh well. At the bottom left is found the lowly dishcloth which I think are nice. My mother in law likes to knit these by the truckload and I always wanted to try them too. These will be for xmas gifts, with a nice piece of soap included. Et voila, there you have my recent industry. Not shown (becasue it is not knitted) is one tote bag made in a frenzy one morning with thrifted demin and this park fabric.I will try and get a good picture of that, but it currently has my pile of T-shirt knitting in it. I have been cutting my old tees into strips to knit into bathmats... intriguing. Never a dull moment around here. Stay tuned for more riveting updates. I found a new use for my wrist warmers on the weekend. They are a bit long for this glass but it has inspired me to make some proper glass holders so I can have my tea in a tall glass for a change. We have a book called "The complete stitch directory" in my library and I may try some new snazzy stitches. "May" is the key word. We'll see if I get around to that. Speaking of May, is it here yet?? I have been working on this fella for a while now! 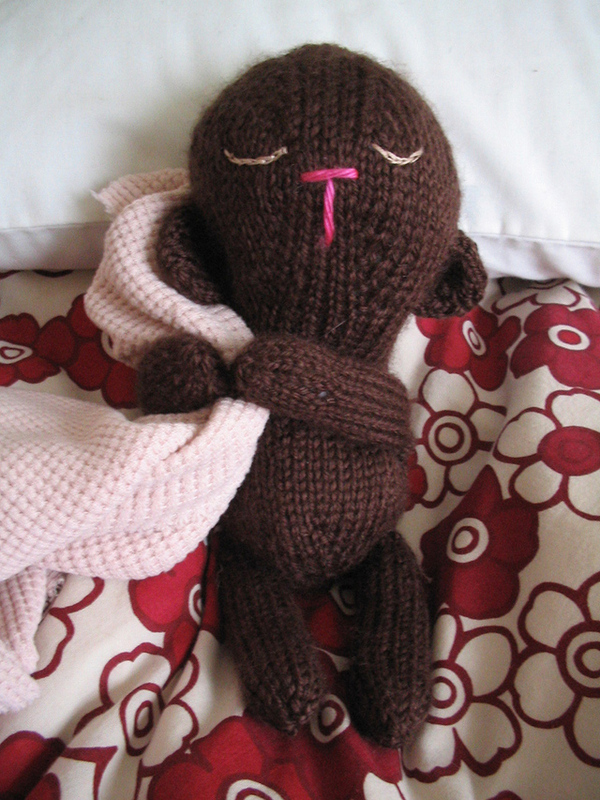 He is, ofcourse, based on a wonderful Jess Hutch Pattern, Henry the Bear, who I altered a bit to make him sleepier. I finished him this morning and again was re- remineded how happy I am making stuff. I have been letting that lapse for sometime with all the real life going on around here. Here he is, as yet nameless, having a little lie down on the bed. With my blankie I might add. We might have to have alittle talk about that as he cannot take my blankie with him when he goes to his new home to live with Stella Henrietta. I only wish I could make him animatronic and be able to change diapers, clean up the "burps" and get them all into snowsuits and out the door. A good Monday morning to you! 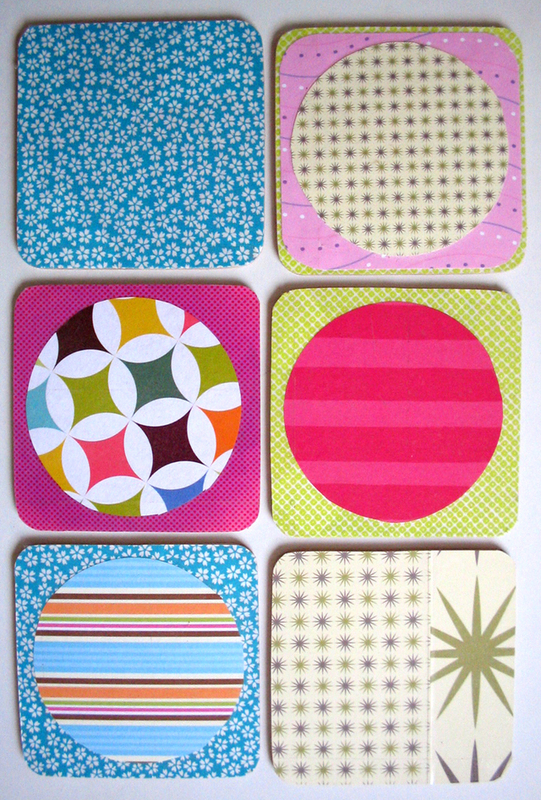 I finally re-vamped my coasters. They had teddy bears on them and while cute in a way, they just weren't me. I knew I had been saving groovy papers for years for some reason. Snow! Boy did we get snow. This was only halfway through. 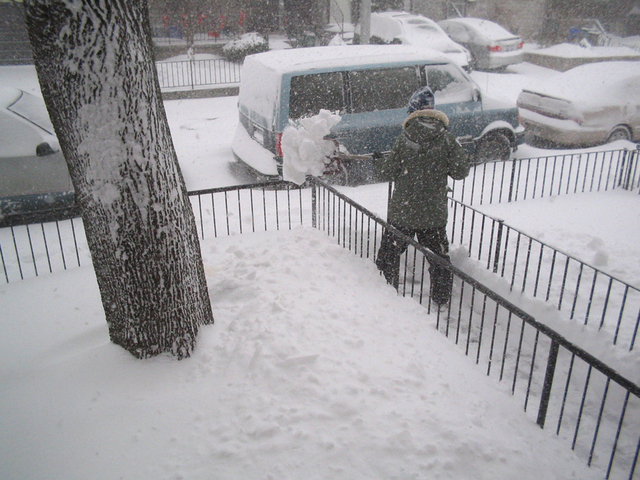 I shovelled again at night and we have a huge mountain at the front and at the back. I lay back onto it after I finished and enjoyed the total quiet (apart from the neighbors radio, which is always on - OUTSIDE. yes.) and lovliness of a snow fall. Today it is bright and sparkley and wonderful. 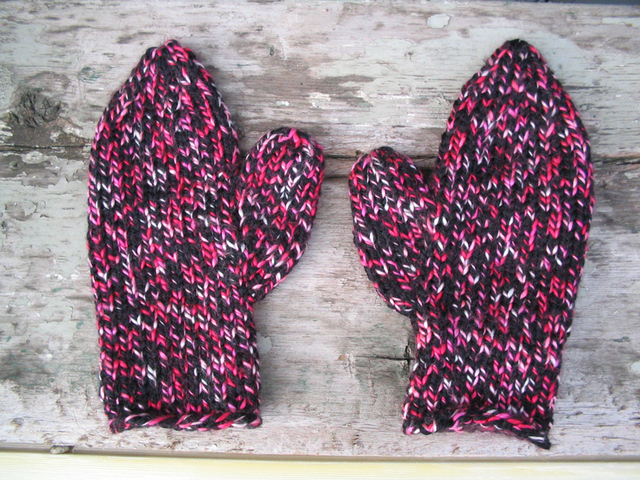 Here are those mitts I started a while back. I have been wearing them for a few weeks now and forgot to take a picture. I also threw in a hat as well for good measure, which I made from my head. I have had to sew a polar fleece lining in it since, to add extra warmth. 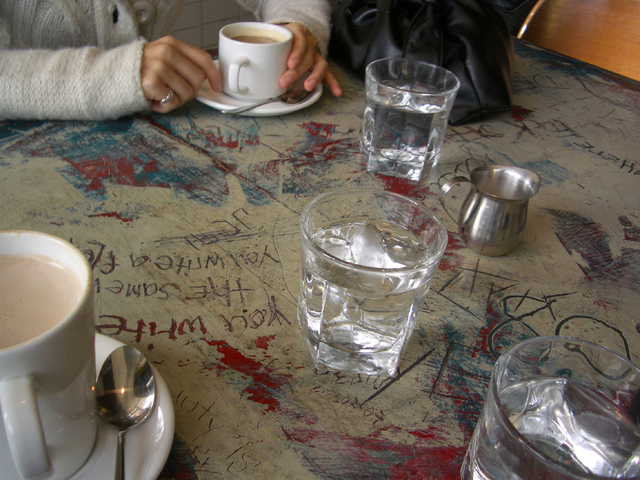 Here is the picture of my coffee date on Saturday. I took it with Pam's camera because of course, I always forget mine when there are nice pictures to be taken! I also missed a really cool shot of a flock of geese flying high up in the sky, with an airplane flying near them as well. It looked amazing from the ground, but no camera! 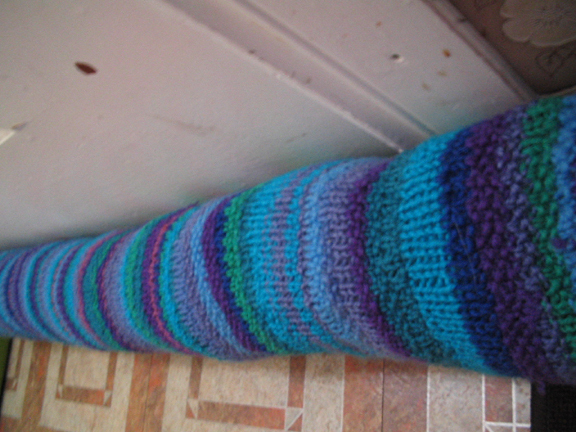 Well it is a draft snake of course, for the back door, which I made this weekend. It is the final use for the first scarf I ever knitted, when I was unable to get my ribbing organised and ended up with a mess of stitches all over the place. It had been sitting in a box for years until Sunday when I discovered it on my quest for something to make this snake with. As soon as it gets cold, I become an old man, constantly feeling for drafts and heat leaks. I *THINK* the plastic on the window helps some, it is a teeny bit warmer upstairs now. I spent much of the weekend knitting. I had Monday off for Remembrance Day. 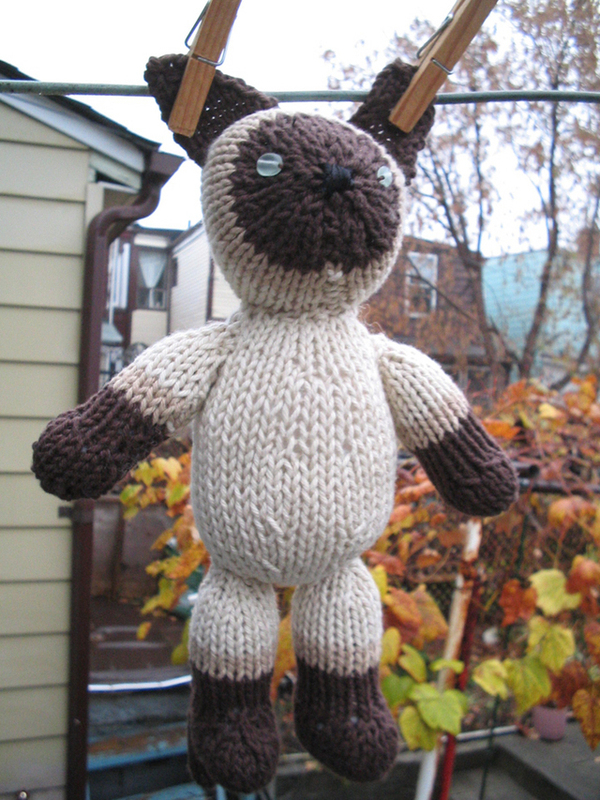 I finished off this cute siamese cat who shall be called toy cat in remembrance of boy cat. I am still not thrilled with his face- I can never seem to get faces right on toys- but I love him anyway. 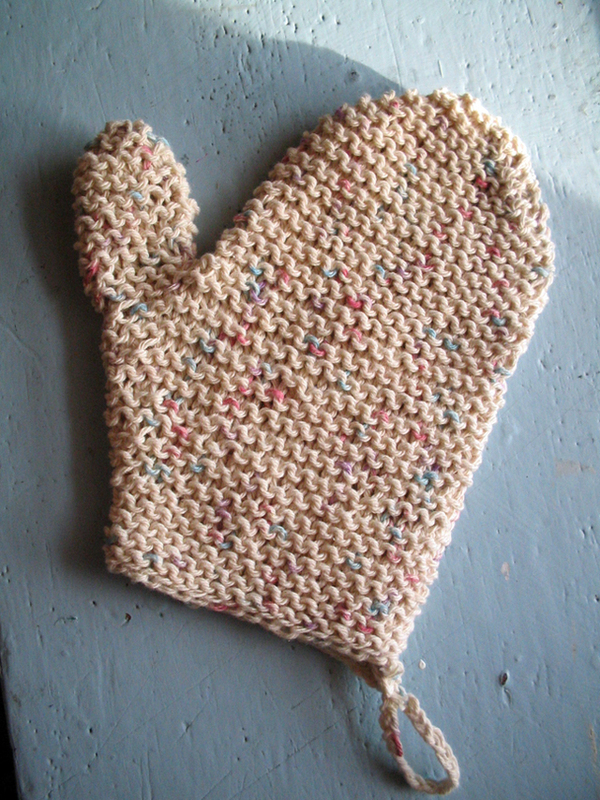 It was made with a pattern from very very cute Fuzzy Mitten! 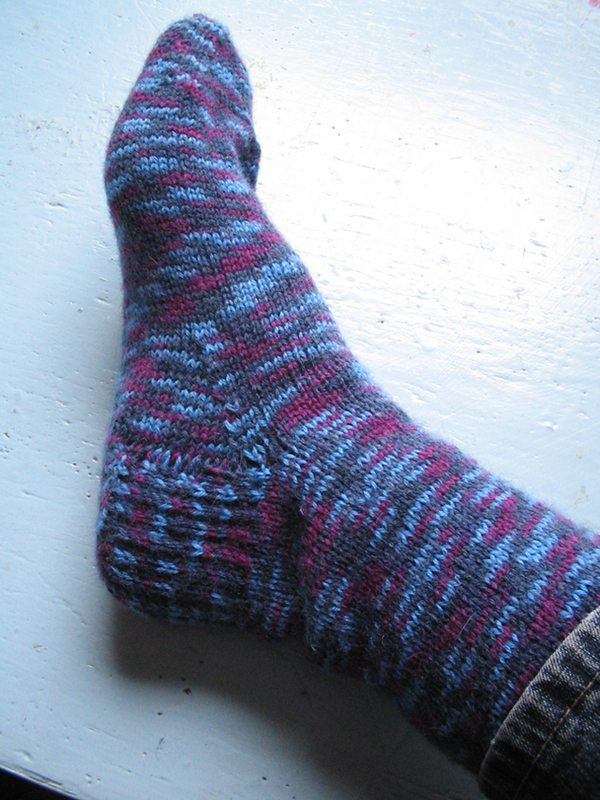 I also FINALLY finished these socks which I started last Christmas. You have seen them in progress on many occaisions -like here or here. I decided I must get them done for Paul's birthday this coming Monday as he had hinted that they should be his socks. Now my brother has gone home to England and there will be no more Yeti movies or coffee breaks for a while- sniffle. We all had a great visit and we'll miss you! Image taken from Knit simple . There is a lovely chill in the air and it is really putting a skip in my step. It is making me FINALLY finally feel crafty again. I love this time of year with brilliant sunny days shining through golden leaves, wearing scarves and socks. I am all exited to rummage in the basement and find my bag of hats and mitts, and the box of winter things. Paul and I got whomped with the inaugeral cold of the season and though he has been home sick all week, I have been able to limp through my normal schedule, if not a bit dopily. 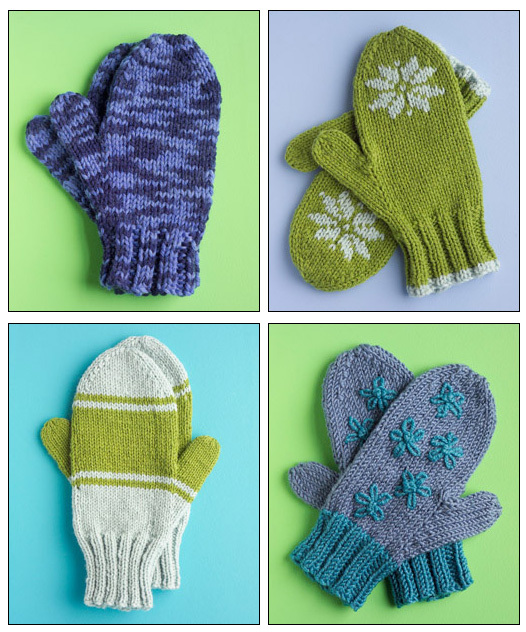 So, I treated myself to the latest issuse of Knit simple because there is a great mitten section - see pics above. It is a nice chart for mitts of all sizes. 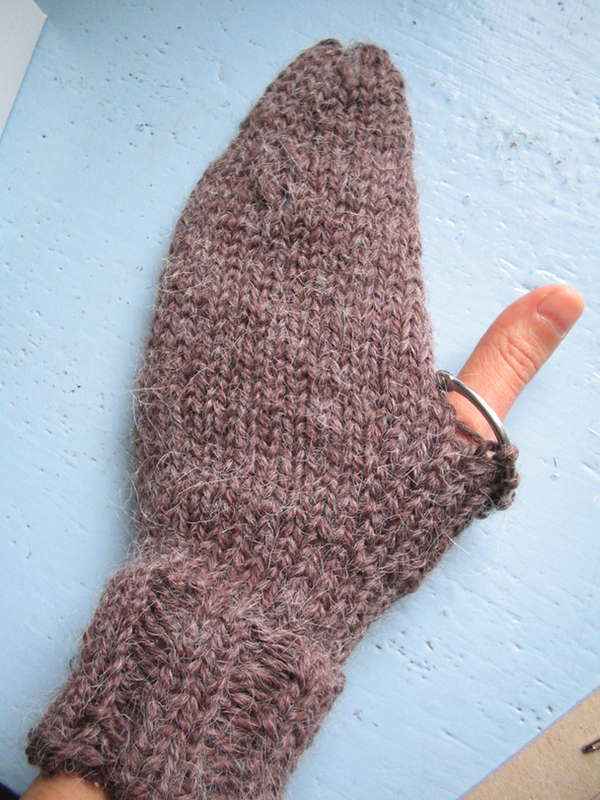 I love the idea of a basic adaptable mitten pattern using a basic yarn, not some crazy expensive one I am too mean to buy. 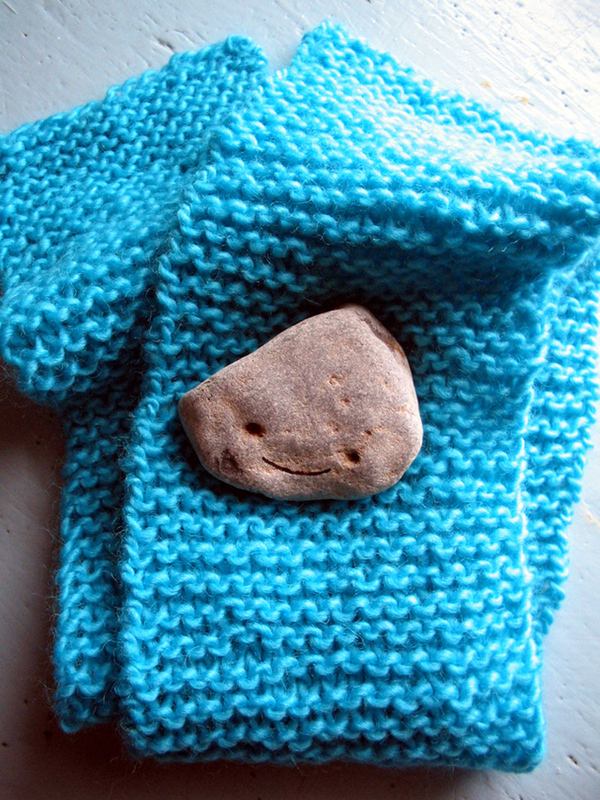 This weekend I knit a bath mitten! How cute. It was a pattern on the label from some yarn and was super easy. Also, this weekend I made a pie! 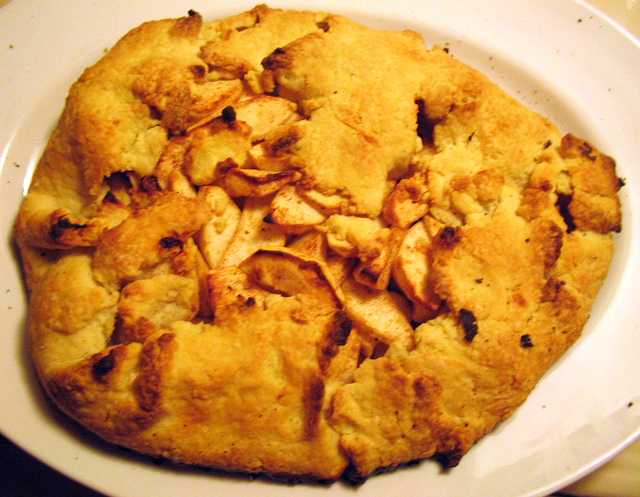 A galette really. I have wanted to make a pie for oh, 9 years, and finally finally did it! I went the galette route after seeing Amy's yummy version. I have been eating it for breakfast. Is that wrong? We also managed to squeeze in a baseball game! Paul got free tickets so we didn't feel bad only staying till halftime. It was fun, just don't ask me who won. I have no idea. 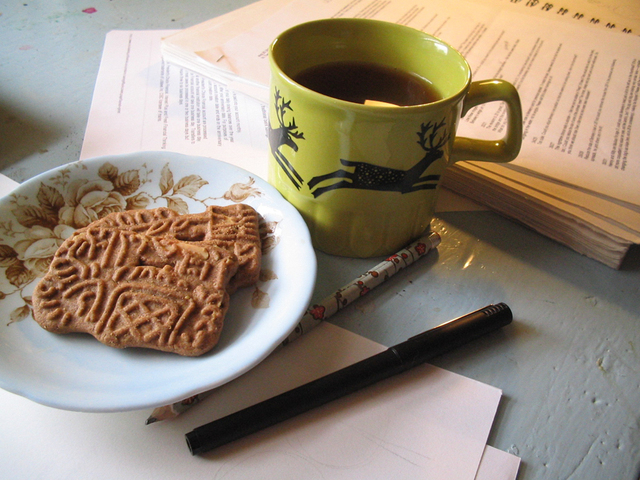 This is actually a tea picture from last week, a tea break mid morning on my messy desk. I will likely re-create this scene over and over this week too! I found this lovely blue yarn in Victoria on our trip and just finished a little scarf- there wasn't enough to really make anything else. You can see it in progress on the porch picture below. My newest friend is this rock I found this past weekend at sandbanks. He already had two eyes and all I needed to do was give him a smile. It wasn't easy, he didn't laugh at all my usual jokes so I had to get creative. 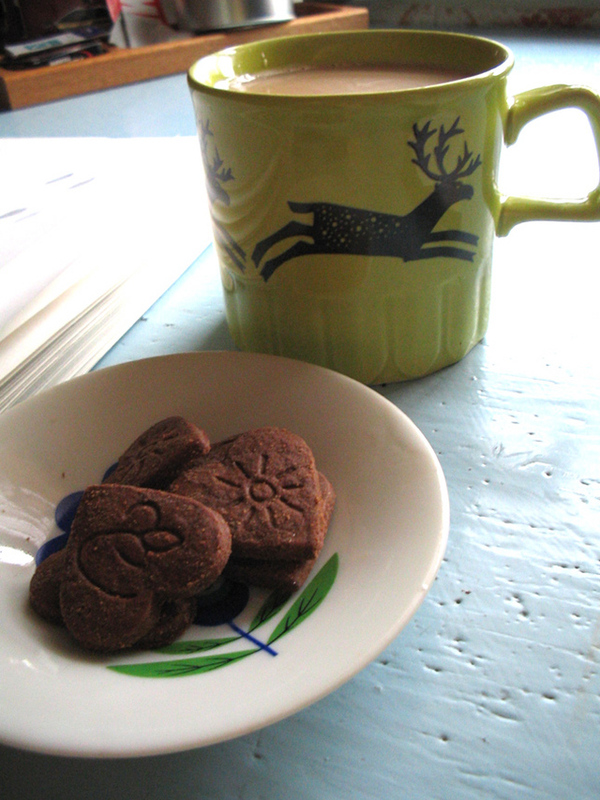 Another tea time, another day. It was a bit grey when I made my cup of tea this morning, so the picture is not great. It was a very good cuppa though, my old standby regular tea with milk and sugar. Tea always tastes better when you have really earned it. I have been working away here trying to organise details, colours, sizes. I won't elaborate incase it is top secret but I have been hired to illustrate a children's book and it is a big honour to have been chosen. I am feeling quite tense with the desire to do a good job and somewhere buried deep is a joy at having a lovely project to do. My horoscope today says "Enjoy your challenges. They are making you clever and creative." So at times when my free time seems to shrink down to zero, I tend to go small. These are some things making me happy right now. I finished my log cabin mat. Or actually I ran out of yarn for it, so it is more like a log cabin handkerchief or perhaps a place mat. Either way I like what it looks like. Yesterday was a bit of a "grey" post, due to my feeling unaccountably jittery. Today though is friday and I am feeling a bit more frivolous and optimistic. So much so that I am posting before I start my work! The decadence! I have not been very crafty at all these days what with vacations and a happily busy work schedule, but I did whip off this apron one night in a frenzy of scissors and thread. 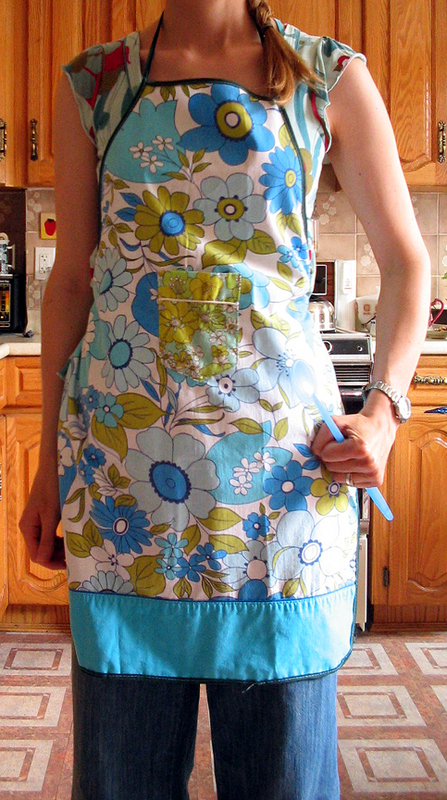 It was really cheating as I merely traced a dollar stor apron, and used it's edge tape on this bedsheet version, with a pocket from an old pyjama top in the middle. I do like to wear it while (whilst?) I cook and I can finally see what all the apron fuss is about. It makes me feel very efficient and organised. I don't actually like to take it off at all. And finally, knitting class! We had a coerced knitting class yesterday after much begging from the girls. I had not been in the mood and felt tired after getting home on my bike, but after I got settled we decided 10 minutes would be sufficient. Boy was I impressed! After a couple of weeks of hollering about not being able to do it, they just sat down and knit, just like that! It was so cool to see their hands just knowing what to do. One girl is Portuguese and her mum taught her the way she had learned in school as a girl, with the yarn looped around her neck. I can't quite even follow how she does it, but it works really well and I am quite pleased with them! My mum is home at long last from 10 months in Mexico and is coming to vist this weekend- YAY!!! I haven't seen her since Christmas. My name finally came up on the waiting list for Mason/Dixon Knitting, at the library! I am so glad because I just love this book. I knew it would be good but it is also just so nice to read and look through. I already tried my hand at log cabin knitting, something I had never seen before for some reason. Mine is a bit wonky but I am driven by the thought of it as the new bathroom mat. It'll be perfect. It has been a busy morning in a really good way. I was up at 7 am ( never happens) to wait for our fix it guy who, unsurprisingly, never showed up. It was lucky I was awake though because my neighbor called to see if I would look after her almost 1 year old while she took her almost 3 year old to the doctor, last minute. Ofcourse I was more than happy to, secretly always hoping for a little baby fix anyway! I got to spend 2 lovely hours with her till her Auntie came to get her. We looked at all my silly toys ( I knew I kept them for some reason), considered the cats and had some blueberries and banana. It was a very nice change form my daily routine and I was so glad I was here to help. In garden news, I was greeted by a jungle in the back dirt patch upon my return from holidays. Have a look at my proud zucchinni plant! 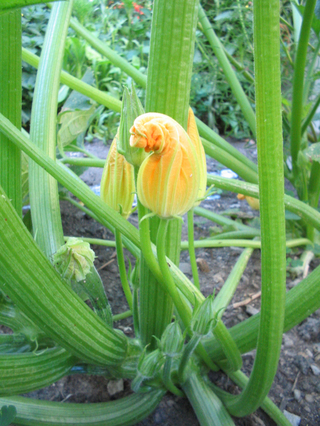 I harvested my first one this morning and I am earmarking it for some fritters perhaps. It seems to thrive on no water at all, along with the nasturtiums and cosmos, which pleases me as I don't water as often as I should and it is rather dry here. Next will be my cherry tomatoes, who are just starting to ripen now. These things and emailing some roughs, getting feedback on some other roughs, tidying up all the emails and I'd say it is time for some lunch! Here's to that nice mood when you feel you have accomplished a lot and feel proud about it. And here's to the nice little babies. It has been a quiet but nice long weekend. On Friday, we went to see Blades of Glory which was as stupid and delightful as I had hoped. The costumes, the hair - you can't lose really. I got in lots of knitting. I am working on a little tank top from the latest issue of Knit Simple. I have a pile of this mission falls green cotton which my mum got at a garage sale (!!) 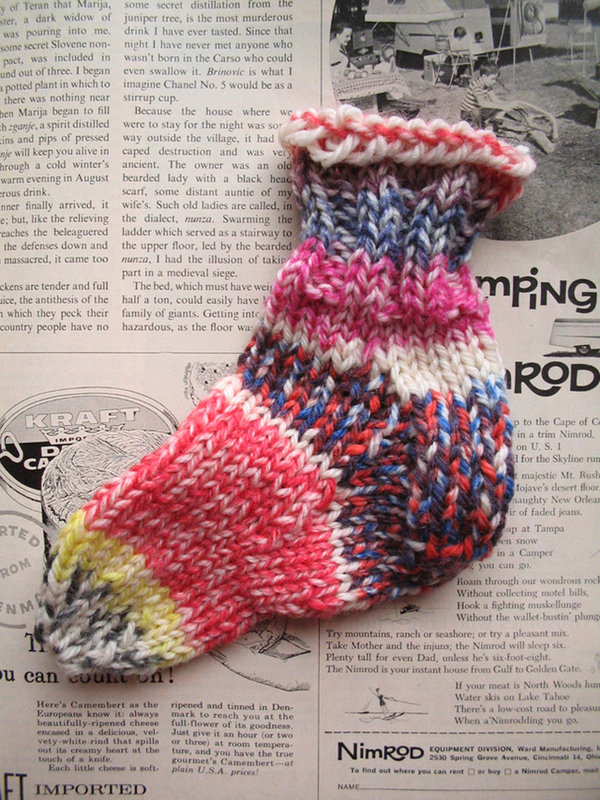 and gave to me, and it fit this pattern's swatch. Sunday we had a short but sweet brunch with friends and today I managed to get to the thrift store where I found a great little IKEA table lamp and this book which I dove into straight away over a bowl of popcorn and a cup of tea. The movie version of this book is one of my favorites , I don't know why, it is just so sweet and I love the actors in it as well. It is going on the shelf of books I keep for when I need comforting. Tommorow it is back to work! -The times being in the midst of preparing food. I love measuring out the ingredients, mixing and listening to the radio with candles burning. -A long walk with Paul after brunch through the neighborhood adjacent to ours, looking at people's houses, thinking about all the families. -The moment of being tucked into bed and reading your favorite book and nodding off to sleep. Currently I am devouring The ladies No 1 Detective Agency books and am just loving their slow pace and kind characters. I am just finishing the sixth volume. -Being covered in cats on the couch watching a movie with Paul and having chocolate ice cream. 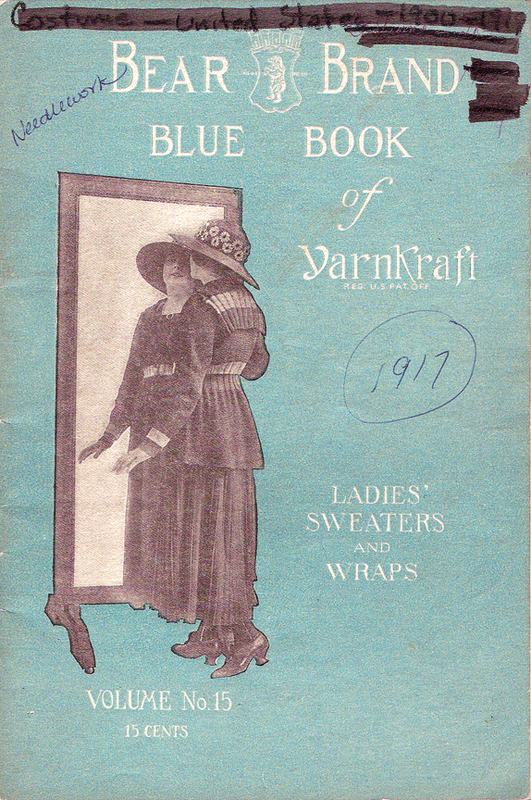 This little gem is a knitting book from 1917. The styles are surprisingly adaptable to today's fashions though and I love this one. It seems like it might be fairly easy to knit up once you figure out which yarn might work and if the size is right for you. View this photo Here is the pattern, if you click it should be big enough to read I hope. I am exited because there is a knitting night planned at my neighbors house two doors down. They seem like super nice people who moved in just after we did in the summer and I have been looking forward to getting to know them. I have my sock to work on and will bring a bottle of vino. I think WIP is not a monday thing, but I forget. Here are my in progress very first pair of socks for a full grown person! I am just working on the heel now and I must say, it is so pleasing watching all the tiny stitches coming along so neatly. I treated myself to some knitting at the kitchen table this morning watching the soft snow drifting down. A treat because its "MONDAY", a day when I usually feel all scrambly and fussy over work needing to be done. Pshaw, it can wait. 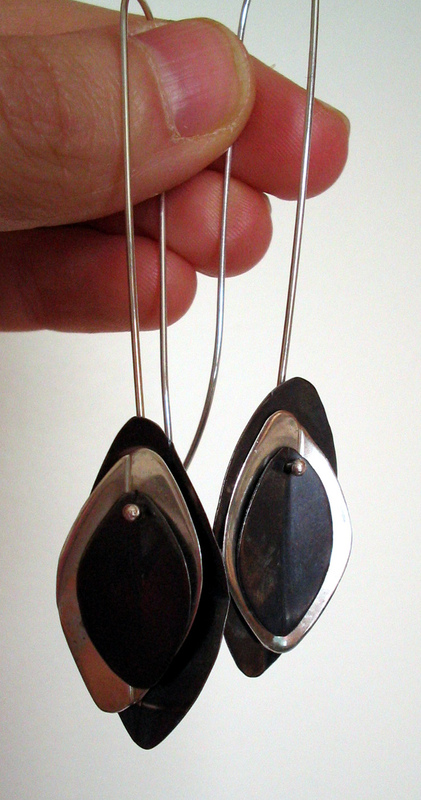 These were a treat to myself at the craft show I did in the Latvian church before Christmas. 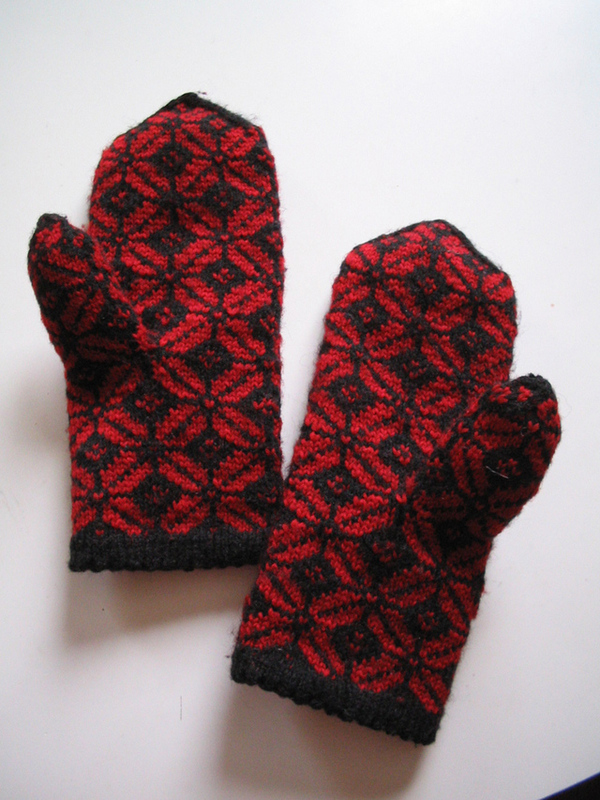 Real hand knitted Latvian mitts! Are they not so lovely? I have always wanted a pair, seeing them on the hands of my friend Beta since I first met her in Grade nine. Speaking of Beta she is an amazing jeweller and we finally met last week for our Christmas dinner - a bit late! I couldn't believe she would give me these top sellers and the very earrings I have been drooling over for ages. I LOVE THEM! Dangly leaves. Also, the report is in, her baby -well, he seems more of a boy these days- loves sleepy rabbit. The rabbit stays in the bed and he will go upstairs into the bed, just to hug him! Aw. I am very pleased, you never know with kids! My apologies because I have made commenting a bit of a pain by having to put on typekey authentication and catcha on due to a showering of some filthy spam comments! 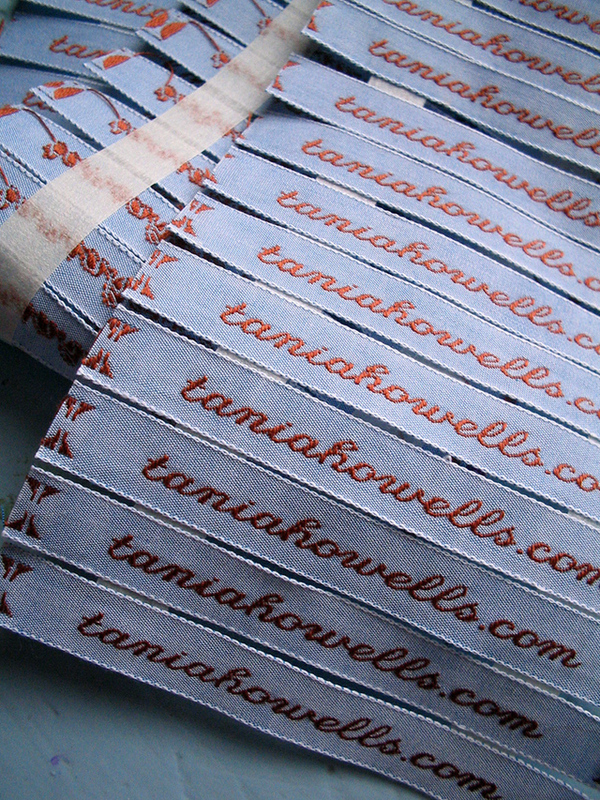 My new labels came today! I like these ones. I decided to change them from the last order just for fun. On a side note, I added a search widget to my sidebar. It's so handy for finding stuff, like the label post, in my archves! Oh technology! My brother is here! It's so nice to have family in our home again. It is a bit empty feeling with only the two of us. Especially at this time of year! Yay. 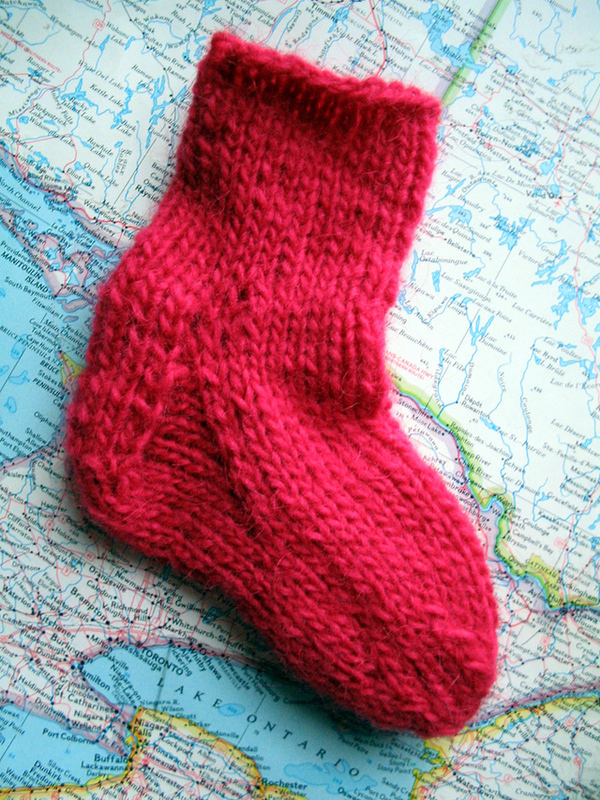 I finished another wee sock yesterday as well. 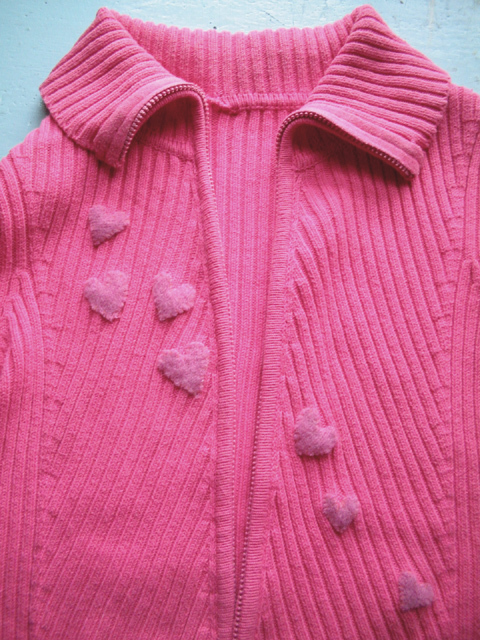 A nice pink one with no ribbing. I was thinking of felting it and using it as a Christmas decoration, or maybe just as a Christmas stocking for the cats. Maybe put some (whisper) catnip in it for them. They go NUTS for that stuff. I could even just give it to them plain though as well. The boy cat has this odd love of sucking and chewing wooly things like socks. I lost my favorite snowflake hat that way! I think it is a siamese thing, but I try and avoid that as it is bad for his tummy. As an aside, because of this sock class I learned the long tail cast on method which is so much nicer than whatever ramshackle method I was using. It leaves a lovely woven edge, not so loopy. This is what the Table looked like halfway through the class and after I was souped up on a coffee I didn't really need. 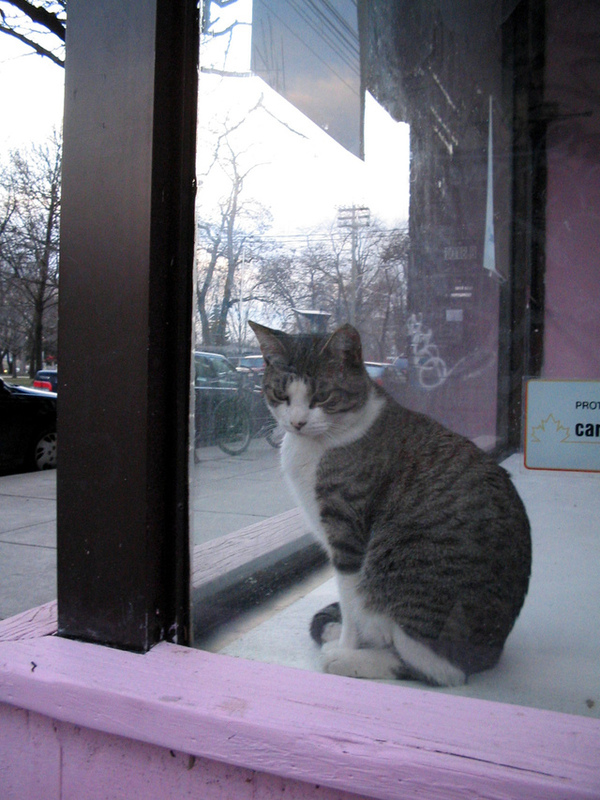 On my walk home I spotted this happy little guy in an empty shop window. Last night I finally tackled my stained sweater project. I had a spot right by the zipper and had been envisioning sewing hearts on it. I used the leftovers of a fulled/felted sweater I had used to make this shrug a while back. 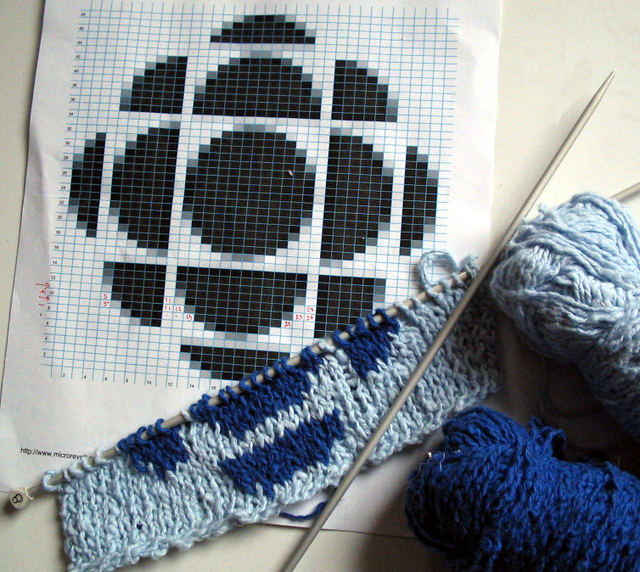 My first time trying intarsia ( I think that is what it is called) by using a CBC logo I uploaded to the knitpro part of Mirco revolt. It will generate a grid pattern for you! I am not sure what I will do with it in the end but I so love a knitting challenge, something to keep in the wings when I have that certain mood strike. 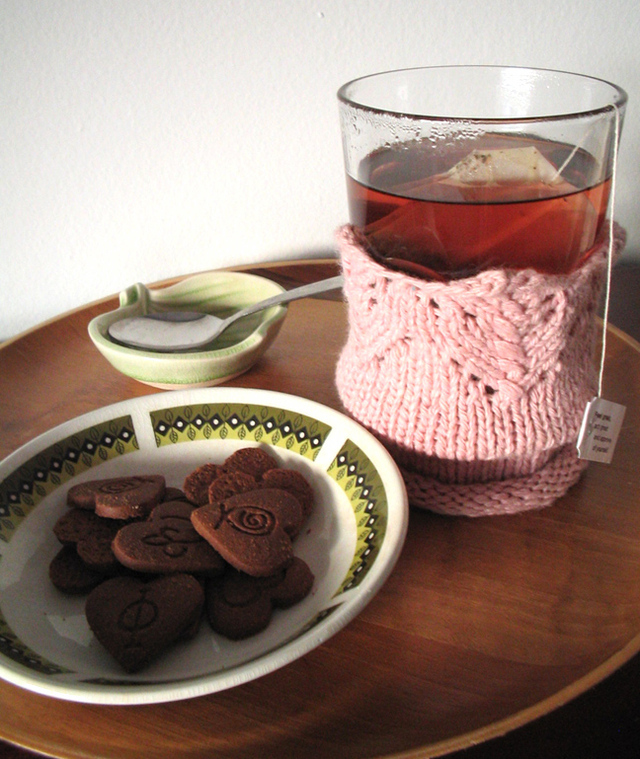 The mood that requires a cup of tea at the kitchen table and some serious knitting. I really have to pay attention to do this and that means no TV, but radio is allowed. Today I am working on this new tree print I came up with. My first attempt at two color printing, on some tote bags. I also think I finally have an idea for this years Xmas card. I'll keep you posted! It is my friday off, so I would like to pop over to the Value Village and see what up, but I will wait till Saturday because Paul wants to go too. I should really get a bit of a haircut too, I am starting to feel like Marsha Brady. I recently finished this face cloth for my mum for xmas. It is from Weekend Knitting. Since my mum is spending the year in Mexico, I though something small and useful would be a good idea. 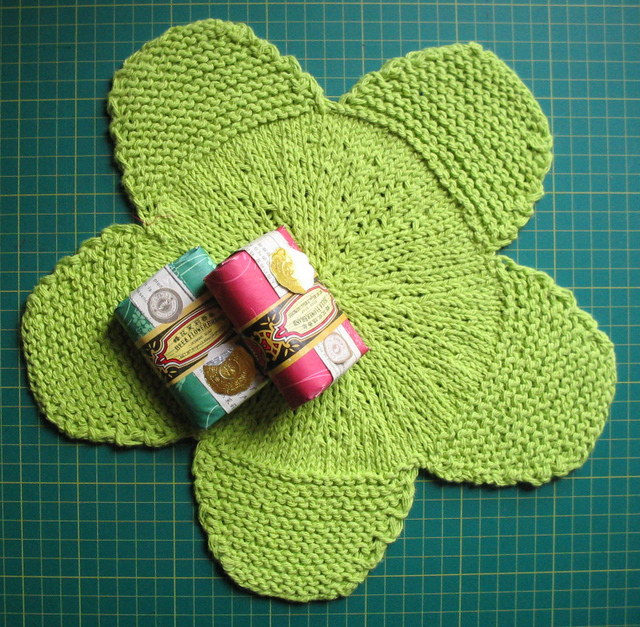 It's funny- I have been on crafty fast forward lately and it is probably because after we moved I felt unable to begin any project, I was so wiped. 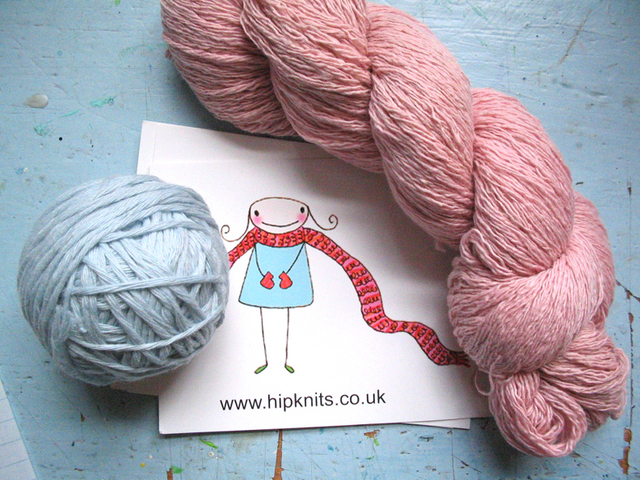 I have a wee sock monkey - my first- in the wings waiting for eyes and a scarf, blank tote bags on the way to print on. My brother is here this week visting so that's been fun. This past sunday was a neighborhood pot luck! It was really cool to meet all the interesting people in my new hood. This is a totally new thing too, a neighborhood group just forming as we settle in. It is something I hoped for but didn't imagine would exist and here it is. yay! I knit up these babies this weekend. 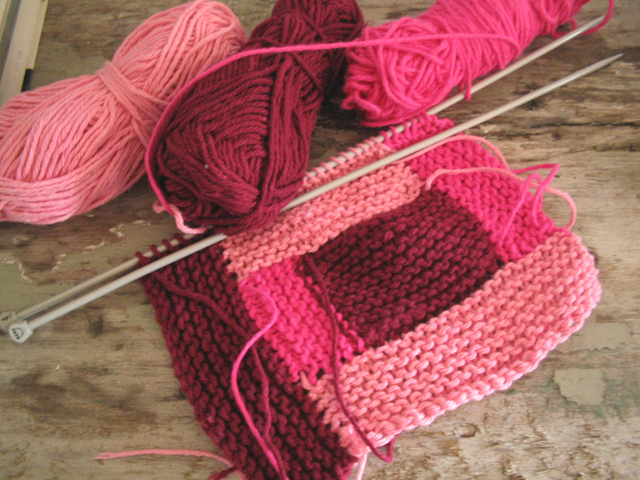 One of the things I love about kntting is that something that once seemed so hard and confusing, can become quite simple once you learn how and try a few times. They are for a friend's birthday and I had been with her on the weekend, drooling over the yarns at a swanky pretty yarn shop. Seeing the selection there inspired me to make mittens for her birthday, but I ended up biking to Zellers after I left her. I just can't bring myself to spend so much on yarn, even though I would like to support these small shops. I was really happy with this acrylic I found. It is super soft and pretty and you can't beat the price at $5.99 a ball. Yipee! 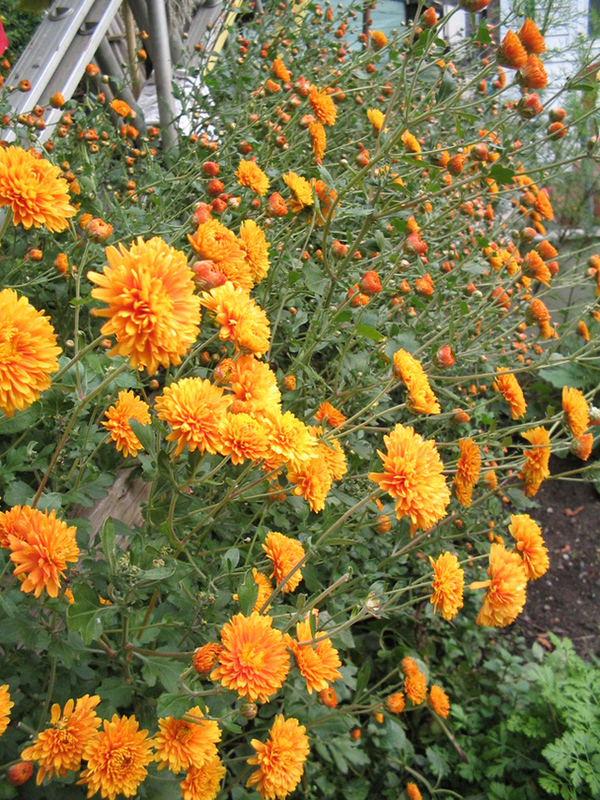 These Chrysanthemums are growing over the fence from my granny neighbors house. I love how they bloom right at the end of it all, a show of colour just as the frost is settling in. Our holiday Mondy was a rare last warm day of sunshine. Paul and I biked over to High Park and met Beta and Kaspar for a snack at the cafe and a nice long walk. I learned that In latvian ducks say "pak pak". Beta's theory is that it is because there is no Q in the Latvian alphabet! Kaspar is so funny - at just over a year he loves to run and tumble down hills over and over without minding the falling at all. I also had a neighbourly moment when my new neighbor to the back and south invited me over for tea by calling over the fence as we both hung out our laundry. I was so happy to sit with her in her pretty house sipping green tea while her 4 year old chattered about his toy dinosaurs. I hope to have her over soon as well. 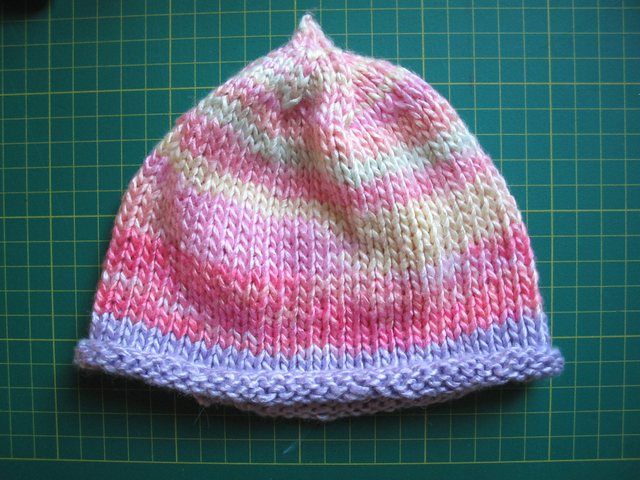 I have a baby shower to go to this weekend so I knit this little hat. One of my oldest friends is expecting her first baby! Wow. I have known her and Eva both since we were 5 years old. On Sunday, I needed a rabbit. 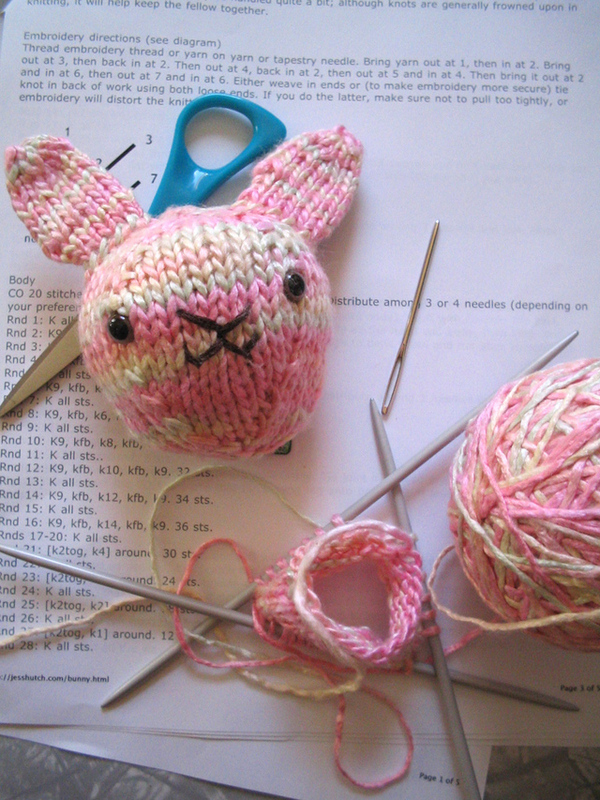 So I broke out my luscious silk Hip Knits yarn and started on the bunny on Jess's site. I have raved about Jess's patterns before, and while knitting up this little head all I could think was "My goodness- the cuteness! This girl (meaning Jess, not me) is pure genius!" I just love how perfectly round and sweet it is turning out to be. Pearls of Wisdom. I try and time making dinner to this show because it is always the most delightful, obscure mix of music. It is fun to cook to and I love the host. After dinner, I have taken comfort during my stressful small feeling last couple of months by watching Rosemary and Thyme on TV Ontario at 9:00. If you haven't seen it, it is a British show about two women gardeners who always come across some improbable dead body or other and solve mysteries! I love it- it is a gentle drama, not too scary or challenging and I love to see for once, older women as the protagonists. Ideally, it is watched in bed, under the covers with the cats cuddled up around me. 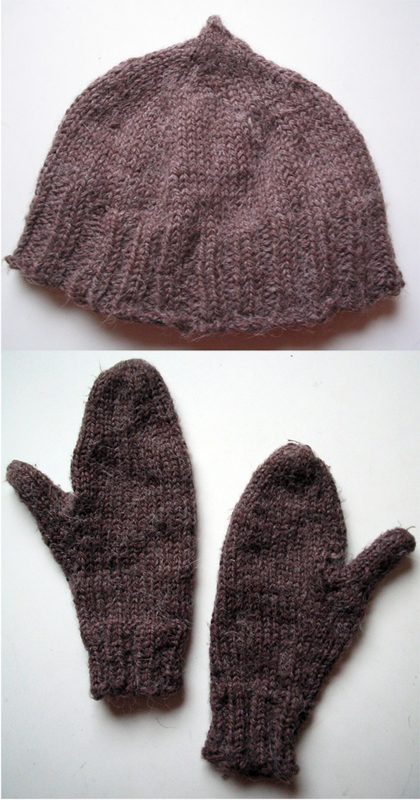 Here is what I knit on the weekend! 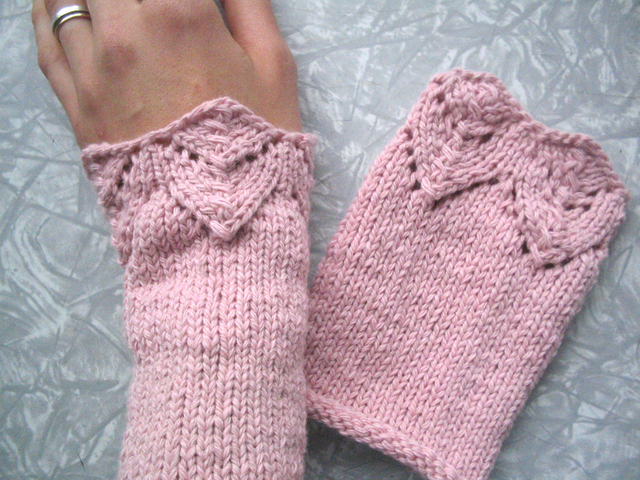 Some wee wrist warmers, just in time for summer I might add. 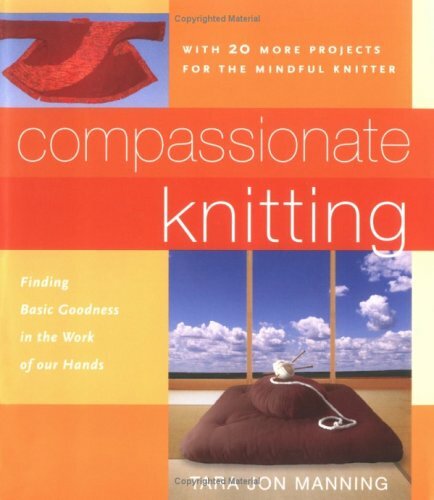 They came form the book Compassionate Knitting and were just right for a long weekend. I was pleased to find the lace part not as frightening as I had expected. The second one is a lot smaller. For some reason I was a lot more tense the second time around so it is all tight. Oh well! good enough! I used this yummy yarn. I am super happy to be a part of this new and amazing kids shop- Mahar Dry Goods! Robert has gathered some of the coolest things out there, so I am honored and exited to join in. Thank-you Robert for inviting me to play! On the knitting front, I came across The Complete Stitch Directory ( it is out of print, so Amazon has no image!) at my library and am exited to learn some new stitches. I knit this with my mum this weekend on the couch while watching an episode of Northern Exposure. 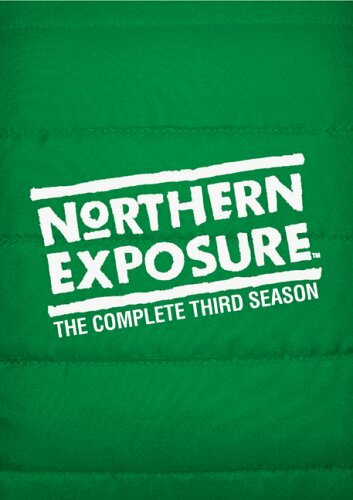 I recently got the complete third season on EBAY and I am loving every second. 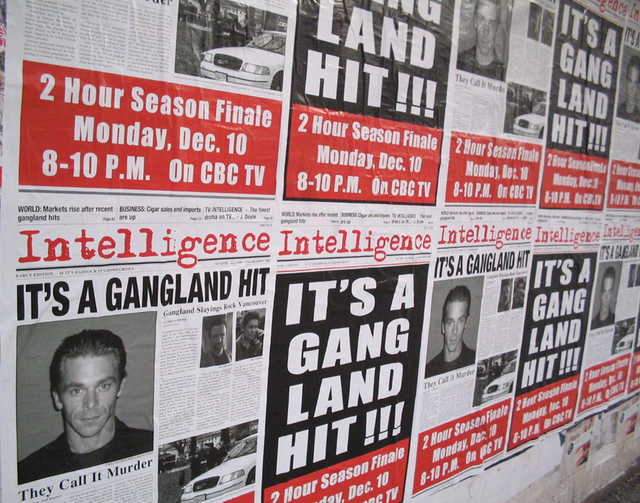 It is so delicious because the first and second seasons only had around 8 episodes. This one has 23!! Paul and I are trying to ration ourselves but it is hard. It is like candy. 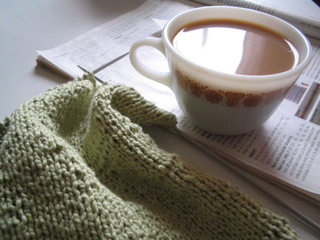 What better way to soothe a jittery heart than with knitting? 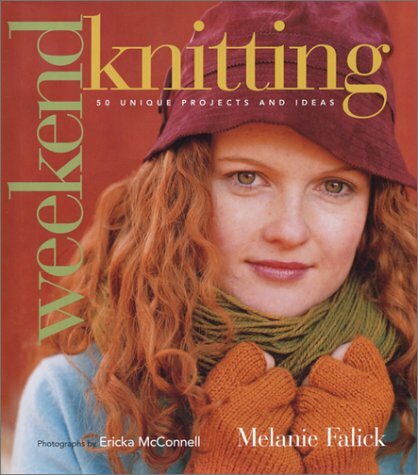 I found the book Weekend Knitting at the library yesterday. 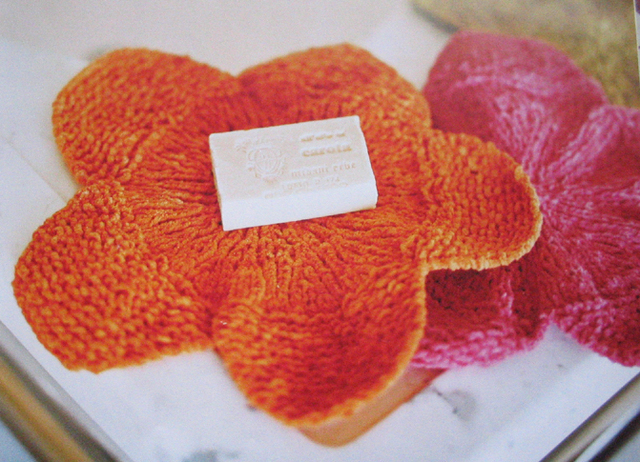 It is a lovely book with not only nice patterns, like these sweet cotton chenille flower face cloths below, but a sugar cookie recipe, tips for a nice bath, and how to have a lovely cup of tea. It is a very comforting soothing book! I am pleased to have come across it just when I needed it. After work yesterday I had some time to spare and found this pretty necklace. I needed a little retail therapy too and this fit the bill as being only $2.99 on sale at Le Chateau. 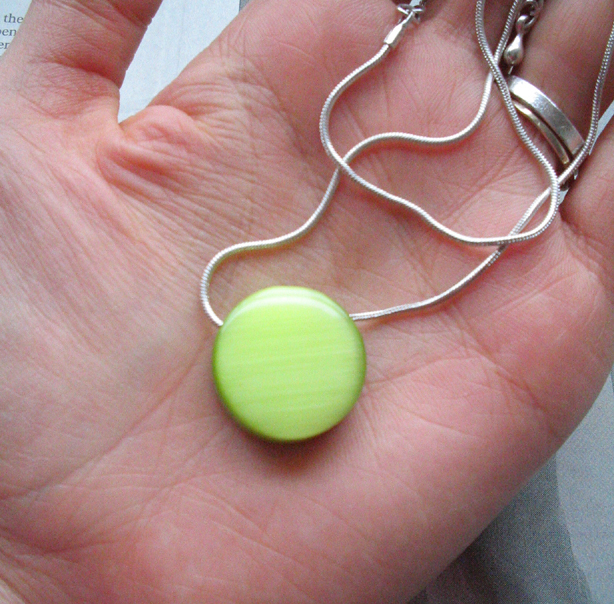 I love it because it looks like a candy, it was dirt cheap and I love this springy green. After that I treated Paul and I to some sushi - mmm. On our way home through the park with our bikes we ran into Max our favorite rock and roll priest. It is always a pleasant surprise to see Max- he has a way of making things seem ok and is such an open non-judgemental soul. "The Comfortable Arts" is a book spine I see in the bookshelves at work and I have always liked the images it conjours up. The book is nice too but it's the title I appreciate - it's quiet, cozy and homey- just what I need today. I have been reading the paper and drinking tea, surrounded by the cats. Paul rented a movie and is cosy on the couch. It's raining. I started knitting a funny granny style slipper with some cheap acrylic a friend at work did not need - it is sort of cute. Tonight my mum comes home from a 3 month long trip in Mexico and next week my brother comes for a visit. We'll have a full house and I can't wait. I miss my family and don't like when they are so far away. Thanks for all the words of comfort yesterday! It is true. I had not looked at it like that before- a door closing does mean a new door opens. Mmm! Aran Cashmere from hip knits! Talk about a nice surprise- thank-you Kerrie! I want to make something special with it, perhaps something in this book. Maybe they have it at the library...or maybe something from the bizarre Bazaar pamphlet. I still have lots of the gorgeous silk and sock yarns from the first wonderful juicy box and now I need to a) learn to make socks and b) find a nice tank top-ish pattern to use the pretty peachypink silk yarn, that currently exists merely for my gazing and feeling it against my cheek pleasure.